& Cares about giving you top quality the FIRST time and every time! Newsletter and Special offer notifications: Click here Why Buy From us?? Note: Discounted shipping or Free shipping ONLY applies to orders COMPLETED and PAID on the internet. Pick SUPER SAVER to get free shipping (or receive discounted shipping if your shipping cost exceeds 10% of your wood total on qualifying orders). See bottom of page for conditions. MINIMUM INTERNET ORDER IS $20.00 ($50 for any orders done by phone/email/mail or fax or export orders). Minimums are before shipping. and receive UPS/USPS shipping at what it costs us to ship + a charge of $5.00 for box/tape for each box in your order (higher charges sometimes apply, see bottom of page). Phone orders are required if you have complicated needs/requests requiring a good bit of extra assistance or if you are ordering anything not available on the website. Please NOTE: Free and discounted shipping is NOT available for phone orders. The minimum for phone orders is $50.00 (not including shipping/handling). Phone order shipping is ALWAYS higher than shipping in the shopping cart and phone orders always have handling charges. As of May 2015 we no longer charge handling fees for orders over $200 that do not require much labeling. Pen blank orders still require the handling fees if you need labeling and you are buying many different types. The reason is that our costs (and time invested) are MUCH higher for phone orders and our prices are based on the self serve model of checking out on your own on a website. International order minimum is $100 for any shipping address outside the USA (not including shipping). 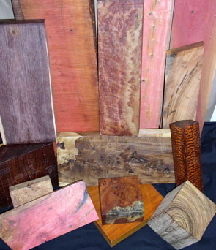 We stock over 90 types of EXOTIC wood. They are all available in turning blanks! *If your order qualifies for Free or Discounted Shipping: Some exceptions apply. You must use SUPER SAVER for your shipping option. Shipping costs that WE are paying on your behalf may not exceed 10% of what YOU are paying for wood/services. You will be billed for amounts above 10% in the shopping cart. Free or discounted shipping is now available in Hawaii or Alaska with SUPER SAVER, but check other options to make sure it is the cheapest way. Clearance items do not receive free shipping unless that item specifically says free shipping is included and you select the shipping option it tells you to select. Free and discounted shipping is not available for orders completed anyway except on this website. * For free or discounted shipping, we will ship at our discretion with the carrier that is cheapest, and we must have an address that allows UPS and Mail (USPS), or two addresses if they are different.. SUPER SAVER SHIPPING can take from 3-12 days to arrive, please notify us and you have not received a tracking number by day 9 (check junk and spam folders please). HANDLING FEES: For most phone/email orders (that don't checkout and pay in the shopping cart) handling charges are $2-$5. For orders under $200 in wood that have many different types of items (multiple quantities of exact same items count as 1 type of item) , the handling fee is $4-$10 to cover the extra time, unless you don't need any types labeled, in which case the handling would be the normal $2-$5. The average internet order takes 14 minutes to process, pack and label. The average phone order takes 1 hour 5 minutes to take the order, manually charge the card, write up the required detailed invoice, and pack and label. We also must pay a higher rate to take your credit card over the phone rather then having you charge it yourself in the shopping cart. This is why we must add the handling fees, to partially cover the extra time involved in non-internet purchases as well as extra banking charges. Shipping is not retroactively discounted after your order is finalized (which means packed), so requests for changes in shipping type must be made at the time you place the order and before we ship it or pack it.